I won’t say I’ve had countless encounters with bears, but I’ve met them many times. Living in countryside shared with a dense bear population, when meeting bears, you come to understand mostly, bears simply need talked to and left alone. It was the fate of Bruno, a wandering bear who died for the mere fact of stepping on German soil, causes reflection and this story. Follows are some of my encounters with bears and a lion. Growing up in the vicinity of wilderness areas, Glacier National Park and the adjacent Great Bear Wilderness, bears were a fact of life. When I was young, my Dad would take me in his pick-up truck to park at a little distance with binoculars and we would watch the Grizzly Bears come to dine at the garbage dumpsters outside of the small village of West Glacier. Eventually there had been a policy change relating to these ‘garbage bears’ and this food supply was shut off, to force the bears back into their natural foraging habits. Years later, there had been a similar circumstance when a train with a grain cargo [maize] had derailed and spilled. The railroad had simply buried the corn and it had fermented. Bears from far and wide had been attracted, began digging up the fermented grain and became horrendously drunk. Again, we would park our vehicle at a distance and watch with binoculars. Semi-comatose, drunk bears would wake up a bit, opening one eye while lying on the ground, reach into the corn and scoop another mouthful and pass out again. Bears that woke up and tried to walk would stumble, fall and roll down the hill. Some were hit by trains while crossing the tracks close to where the corn had been buried. It became an environmental scandal and the railroad was forced to return to the site, dig up the corn and haul it away. We had a HUGE blonde Grizzly mother with her two very large and nearly grown cubs, clean out our apple tree one Fall season. It was not a big deal, we let the bears have the apples and the bears left us alone. If by chance we met, they always ran, preferring to harvest our (now theirs, actually) apples alone. I nearly stepped on a napping Black Bear behind our house, it had found a depression in the cool ground, in the dark shade of a large tree and was sound asleep in the heat of the afternoon. I happened to walk nearly on top of it while out assessing another Fall season’s firewood harvesting. The bear jumped up from seeming nowhere about two meters in front of me as I walked and let out a tremendously frightened yowl, I’m certain both our eyes looked like Mr Magoo on a roller-coaster. The bear ran away from me. I was walking in the forest with my youngest, at that time a nearly new-born infant, asleep in a baby pack strapped to my chest. I was in a creek drainage where two trails converged as I walked down a hill. I saw a Cinnamon bear walking down the other trail and realized we were on track to meet precisely where the two trails met. I understood that if I stopped and stood still, the Cinnamon would continue walking downhill unmolested. That is what happened, the bear passed us about twenty meters away. My oldest son went into our garage one evening, from our kitchen, the large garage door was open to the outside and he saw what he thought was our large black dog eating from a big bag of dog food. Going over to give Zeus a pat on the head and scratch his ears, a black bear’s head was what emerged from the bag. He came back into the house with eyes as large as silver dollars, the bear had freaked out too, and ran precisely in the other direction. Not far away from where we lived, near Bigfork, Montana, a 12 year old boy out playing alone, had inadvertently found himself caught between a mother Black Bear and her cubs. The mother bear had knocked the boy down and laid on top of him while she bawled out the danger call to her kids who went up trees and then let the boy go, unharmed. I was hiking in the Bob Marshall wilderness and camped beside the Spotted Bear River, by the riverside trail. Along about midnight, a Grizzly bear that left prints as large as a size 16 men’s basketball shoe, walked past on the trail and could have cared less about bothering me in any respect. On another occasion in the wilderness, I was resting along a hiking trail on a mountainside with one of the most incredible dogs I have ever owned, a female Wolf-Malamute cross. The was a large bolder obstructed our vision but the dog told me, without making a sound, there was a bear nearby by standing on her haunches with the hair up on her back, forelegs out, precisely as bear stands. Moments later a large Grizzly walked around the boulder, point blank, saw us, turned and galloped away. Back at home, one day I was curious as to why cars were repeatedly slamming on their brakes in front of my house, so I walked outside to have a look. A mother Grizzly and her two cubs were grazing on dandelions alongside our house. I came back inside, told my family we would have to be alert, and not to disturb the bears. 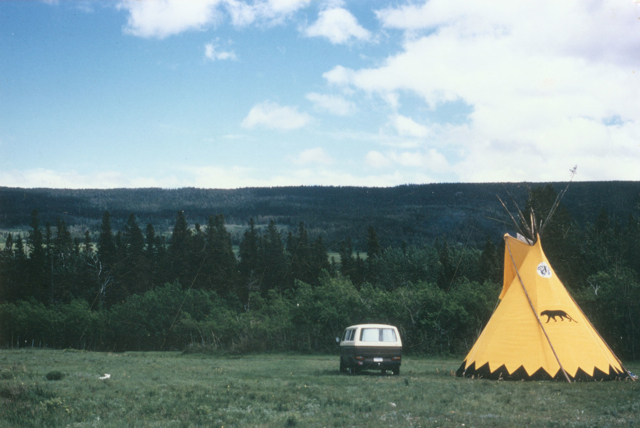 For two weeks we would look out the windows of the house to ascertain the location of the bears, before going out of doors to do chores, make a local trip in the car, or whatever. There was never any aggression or fear on any parties part, bear or human. But then one evening one of the cubs took an interest in our cat door and the dynamic had to change. I called our game warden to come and relocate them. He brought three traps, caught both the yearling cubs but not the now thoroughly enraged mother. So, a second warden was placed in a trap that was closed on him, the trap (they are like small steel jails built on trailers) was driven to where the cubs were in their traps and from inside the closed trap the warden shot the mother, who emerged to defend her trapped cubs, with a tranquilizer dart and the problem was solved. The bears were driven 70 miles away, and were back in two weeks (she had been radio collared) but avoided homes and people after. It was in Yellowstone Park I saw a park ranger with an expression looking like it was the worst day of his life. Alongside the road were many parked cars and about a hundred tourists standing alongside the road. Between the tourists and a large male Grizzly busy over-turning rocks and logs, looking for insects to eat, stood the single, unarmed ranger, his back to the bear, about twenty meters behind him, facing the tourists to keep any one of them trying to approach any closer. We simply kept driving, Grizzly Bears being no novelty. There must not have been a problem, because we did not hear news of any incident. At five years of age, my dog, Zeus, was a veteran, weighing in at 80+ pounds and extremely fit, he had harried numerous bears off our property including several grizzlies. Zeus technique was to dart at the bears hind end, causing the bear to have to wheel again and again to protect his backside, ultimately convincing the bear that whatever he was attracted to was not worth the bother. It was awesome to listen to the dog on bear contest, tearing up the turf and in turn making their fiercest noise after dark, alternately dog-bear, bear-dog. Most of these encounters had been in the night, due to the nocturnal habits of foraging bears near human habitation. In Winter, when bears are denned up, Zeus, a Wolf/Husky cross, patrolled his beat mainly concerned with keeping the coyotes at bay. At dusk on St Valentines Day, February 14th, 2001, bears being denned up, I had no great concern when Zeus put up his great display of black mane standing up in a roach and his most powerful bark to alert me to trouble. Not worried about at all about bears, I stepped outside expecting a Raccoon trying to get into the chicken house. I was without a firearm, when walking over see what the trouble was. As I approached Zeus, I saw a Mountain Lion charging directly at me from 25 meters distance. Instantly I was in full retreat back to the house but it was looking too late, a real race as to whether I would make it to the door. Looking over my shoulder I could see the lion had closed what looked like over half the distance to me and I had only covered about half the distance I needed to be back in the house. Ridiculous thoughts were flashing in my mind, I remembered you don’t run from lions or they will give chase -the lion was after me already- at what the Game Warden later would tell me was a speed approaching 45 miles per hour. But I need not have worried. Zeus had put himself directly in the lions path and intercepted the charging predator. As I slammed the door behind me and glanced out the window as I ran for a firearm, Zeus and the lion were in what looked a like a ballroom dance pose, both up on their hind legs and embraced, contesting to bite and grasp the others head or throat. I knew at that moment that I was going to have to be fast to save Zeus, because a dog, no matter how brave and strong, is no match for a lion. At the far end of the house I grabbed an old Remington pump action goose gun and a box of #1 Buckshot, spilling shells as I ran back across the house. Now Army training from 30 years before had kicked in like a well oiled clock- As I was moving, by the numbers, I was pushing a shell into the magazine, opening the action with the pump, locking the action, loaded, with safe off, I pushed open a kitchen window with one hand, dropped the barrel of the weapon through the opening with the other. At this point the lion had Zeus down and the only shot I could take was for the large cats hips. I fired and the lions rear legs went out from under him but he was not dislodged from the dog. But now Zeus was able to roll the cat over and was on top and had the lion by the throat- and I was able to shoot the lion through the head, ear to ear, from about five meters. It was a close call to fire buckshot that close to Zeus but it was a shot that absolutely had to be taken. The cats last move was to wave his long lion’s tail like a flag in slow motion surrender. The lion was shot dead in probably about 30-45 seconds from the time I saw it charging me. Zeus stood back from the large cat at that point, watching intently, willing to quit if the lion was done, but ready to fight some more if need be. What a dog! And what a way to begin my 50th year! Zeus was in remarkably good shape for having had a lion encounter, he had a torn ear, 3 puncture wounds to the head from the lions primary killing fangs and a slight skull fracture resulting. He fully recovered. 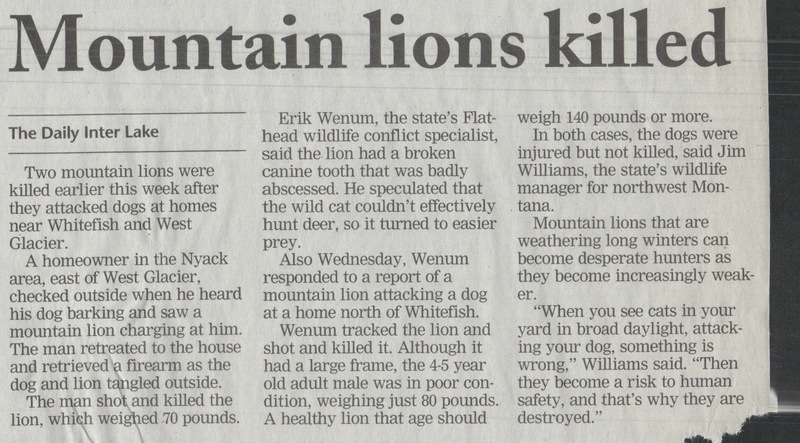 The lion was estimated to be a five year old adult that was desperate because it had one of its four primary killing teeth broken off and badly abscessed; it was no longer able to effectively take its natural prey of elk and deer. The investigating Game Warden speculated the lion was stalking Zeus when I became the target of opportunity. We had bears, but it was a lion would have killed me. In the end, Bruno was murdered, shot dead for no reason other than the irrational fear ‘civilized’ people have of a large wild animal’s undeserved stereotype. In fact, Bruno posed less danger to humans than the many wild pigs running free nearly everywhere in Germany. Certainly Bruno was not a threat approaching the threat humans typically pose to each other. Fear and loathing killed Bruno the Bear.